The episode we’ve all been eagerly waiting for. 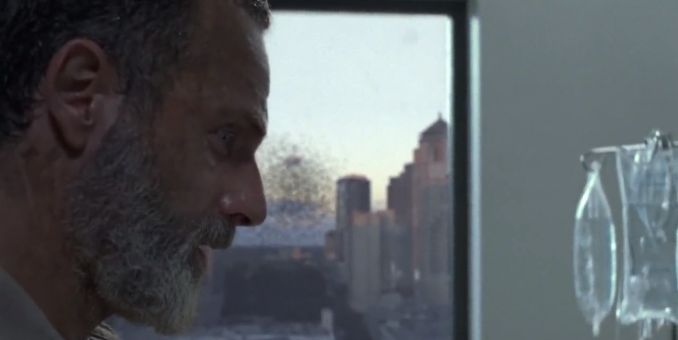 As the intro starts, we see Rick hallucinating back at the hospital from the very first episode. This is incredible to see, the power of this hallucination we see is completely mesmerising. Rick is talking to himself, as he tells his past self to wake up from the coma. So we know we’re in for a rollercoaster of an episode if the first hallucination is already confusing us. We’ve never seen anything like this on The Walking Dead and by god does it really set the atmosphere for the episode. Cutting back to real life, Rick is still stuck with that bar impaled right through his stomach. As strong as he is, he undoes his belt to pull himself off of it. Complete agony is felt by everyone watching, not just Rick. Rushing for the horse as it’s his only escape, he manages to get on to it with the huge herd closely behind. A sense of hope falls upon the viewers as he resumes what he was doing in the first place, leading them away from the bridge. 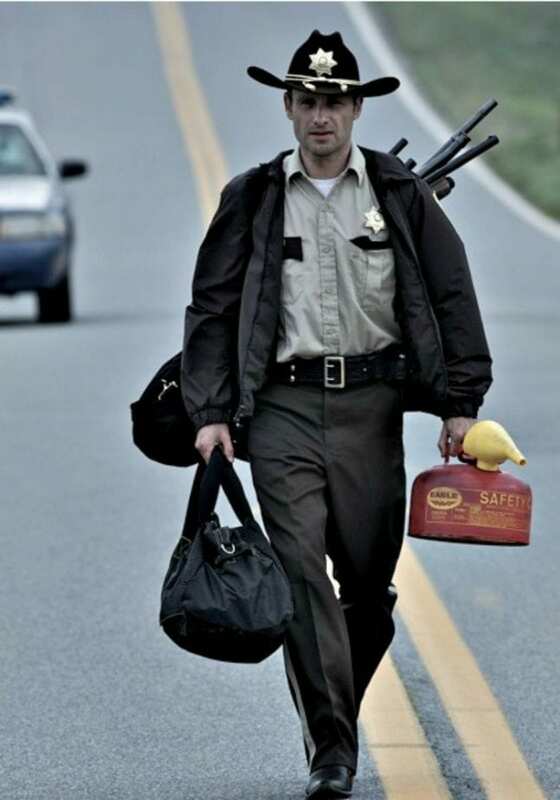 The whole episode Rick doesn’t want the herd to get there, but it eventually does. Why? Because it was inevitable. This was Ricks final mission, to save his family by giving up something that he cared so much about. The episode begins with Jadis in sheer panic as she can’t get her vehicle to start. This tells us that she’s heading somewhere to secure the A for departure. The mysterious voice contacts her, telling her that’s they’ve been watching her as she lies to them about having the A already. The voice doesn’t want any tricks to happen, or consequences will occur but what could this be? Simply leaving her to the grave shes dug? The A she lied about having was Gabriel, but he left the junkyard without her as the voice tells her that they’re watching her every move. By this point now Jadis is desperate, she doesn’t know what else to do. As we saw in the previous episode, we see Maggie and Dianne both clearly heading to Alexandria. Dianne has been loyal to Maggie ever since she believed in her as Hilltop was attacked. “Just… you’re a good leader. I knew it before, but last night… you saved the gates, you saved the community, you saved lives.” This is the direct quote that she said to Maggie in the episode. So she is right to accompany Maggie on this mission she has set out on. With the crowbar she took from Hilltop, we see her take out a walker. But not in a very clean way, she is seriously angry and completely destroys it as she’s covered in blood. Cleaning the crowbar, we see her remount the horse. We know what Maggie is heading to Alexandria with that fire burning in her eyes we’ve seen in the past episodes of this season. She is going for one thing, and that’s to take justice over Negan. We are cut back to a heartwarming scene to give us a break from Rick’s encounter where we see Michonne and Judith sharing a conversation. Judith is talking now which is nice to see. Scott entering the room tries not to disturb them as he reports to her that Maggie is here. As Judith overhears it she is ecstatic about the fact Aunt Maggie is here, bare in mind she hasn’t seen her in a very long time but still remembers her. As Maggie is walking down the streets of Alexandria, she comes across the prison where we know Negan is being kept alive. 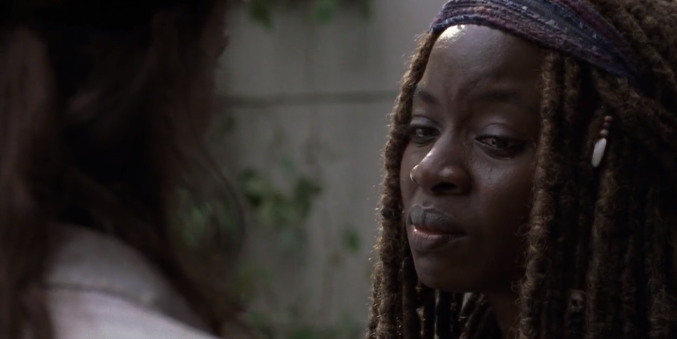 Michonne knows that she isn’t here to just talk to him, she’s here to kill him. Telling Maggie to step back, we see Michonne literally laying her life on the line to keep Negan alive. If he dies, then what Carl envisioned for the future would now be completely gone. Negan has to be kept alive to honour the dead, if he’s killed along with them then all of this would be for nothing. Maggie explains that she’s doing this for herself, for Glenn and the others. Telling her that he should’ve died under that tree instead of Siddiq being told to save his life. Why was it Rick’s decision to keep Negan alive? It wasn’t. It was Carls decision, Rick was just honouring Carl and after all this time and only Michonne sees it. Maggie is just taking it personally, by killing Negan she thinks that it will give everyone the chance to start over, but it definitely won’t. It will start something else as Michonne tells her, friendships will break and new enemies will rise. She also tells Michonne about that she was there that fateful night, she saw what Negan did to Glenn and Abraham. If it was Rick instead of Glenn, I do believe that Michonne would’ve been sent into her endless rage and taken revenge. Killing Negan without question. However, that didn’t happen. That’s not how things went down. Glenn wouldn’t want this though, having to kill Michonne to get to Negan to put her mind at rest. Her father (Hershel) also wouldn’t want this, he didn’t raise Maggie to be a murderer. Maggie explains that the only thing she wanted on that final day of the war, is to see Glenn’s murderer die. And Rick took that from her. Taking it back isn’t going to start things over it’s going to start something else. It’s been a year and a half since Rick took that choice from her, and she’s finally broken and can’t deal with it any longer. It’s not a choice as she explains, she can’t just turn it off, it’s burdened within her as she’s told by voices in her head to kill Negan every single day. Michonne is reduced to tears by this point as well as Maggie, as she steps aside giving her the key letting her inside. Entering the prison, we first hear Negan laugh as he isn’t surprised that Michonne gave up and let her in. Telling her that she’s got the fire within her, that I mentioned in previous episodes which has been scaring us. Maggie’s been on a destructive path for the first time in the series, not caring about what comes after as she can’t live with what’s happening to her now knowing that he gets to stay alive. The lighting in this cell for the first time in this season shows us Negan in full, not just slightly. Telling Negan to get on his knees, he tells Maggie about that night where he heard her screaming and how much he broke her after breaking open Glenns skull. Negan asks if she’s come for revenge, but she replies with justice. He asks her about why has it taken this long to come and see him, it’s taken her this long to crack and deal with it. Not at a good time either, as Rick’s story is finally coming to an end. Or is it? Negan carries on intimidating, winding Maggie her up as he talks about the death of Glenn. Specifically, the part where he “popped out his eyeball”. Here’s an interesting part of the scene though, to me he seems to talk about Maggie’s father (As he talks about her old man) who he never even met or knew about. Telling Maggie that he enjoyed killing him? Is this Maggie’s mind playing tricks on her? Is it the last push she needs to finally deal with Negan? Maggie is hearing what the fire inside her wants to hear in my opinion, to drive her over the edge, to give her that last bit of confidence. However, I read further into it and found out that old man doesn’t just mean someone’s father, it can mean a husband etc too. He’s on his knees now, pleading her to kill him and that everything he did was worth it in the end. Telling Negan to move into the light, he thinks that she’s chickening out and getting nervous. So taking advantage, Negan begins to raise his voice and shout at Maggie as he knows now that he is scaring her. 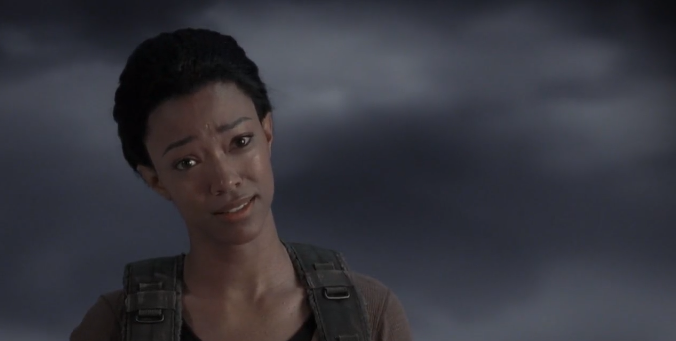 Even comparing her to Rick as he spares his life after so many times of promising that he’d kill him. Even crying, we’ve never seen Negan sob (The shedding of a tear as he finds out Carl is dead doesn’t count) Maggie opens up the cell and throws him into the wall where the light is. Negans finally had enough, as he begs for her to kill him. But why? Maggie wants an answer, as he tells her so he can finally be with his wife (Lucille) as mentioned in the previous episode Michonne doesn’t know the whereabouts of where she is (the bat). This broke Negan as he still sees the bat as his wife, it’s his last connection to her in this world and he would do anything to see her one last time. So being killed is his last hope to see her again. This completely shocks Maggie, stuns her almost. Negan admits to trying to kill his self in the cell by slamming his head against the wall in the previous episode for example. Notice how as soon as he exits the cell he really breaks down, it’s his last attempt at begging Maggie to kill him. A very powerful line now comes from Maggie’s mouth, as she realises just how broken he is. “You’re already worse than dead”. Does she finally see where Rick is coming from? Did it really have to go this far for her to see it? I’m so glad Maggie doesn’t kill him as she tells him to get back into his cell. If she’d have killed him, then the tension wouldn’t be there. Yes, a lot of us would’ve been relieved but again this goes on to Morgans quote “All life is precious” as well as Ricks. This new world that Carl envisioned is everyone’s, not just Maggies. Not just Daryls, and not just Ricks. It’s for everyone to thrive in, to rebuild the world in. “That settles it” as Negan comes to his feet, she walks back to his cell and shuts it behind him. What do you think this was though? Do you think it was an act? I can see how real it was to Negan but after all, we’ve seen by now from Negan it could very well be an act. I hope it isn’t, I’d really like to see a different Negan from the comics, contributing to the world after Ricks departure. After all, do you not remember the dream sequence we saw of Negan and Judith picking tomatoes? And do you not remember the previous episode in this season where Rick picks the first ripened tomato? This has to be foreshadowing, this scene is definitely going to happen in the future. Walking out of the cell, Michonne sees that the crowbar is not covered in blood and a gunshot wasn’t fired. Before they get a chance to speak, Dianne comes running telling them something’s happened back at camp. We know that it’s from the last episode, as we saw the Saviours and Carol along with a few others in a firefight. Will we see anyone injured, I don’t think so. Showing someone from there injured or killed won’t have much of an impact on this episode compared to what’s going on. Getting back to Rick, he is falling in and out of consciousness on the back of the horse. We see Rick trying his hardest to stay awake by mumbling words to his self like “stay awake” and “I need to keep them safe”. Rick is the foundation of this show, and he shows the complete courage and strength that he carries with him. Coming across a cabin in the woods, the mailbox seems to have “Cardille” signed on it. Is this related to the direct reference of Lori Cardille from Day of the dead? I believe so. This is complete foreshadowing as Lori Cardille is an actress that plays the character of Sarah that escapes the undead via helicopter. Just like Rick is going to. Die-hard fans will be ecstatic to see something like this implemented. This one is hidden so a most likely rewatch of the scene is needed. I can’t see what else it references to otherwise. Arriving at the cabin we see the graffiti on the front of the door saying “Come face me, assholes”. Using his initiative, he rips the cloth off of the table and creates a bandage to keep the pressure on the wound. Remember, he has a hole literally through his stomach. We see him fall unconscious again, as we are shown possibly the most famous shot that describes The Walking Dead. 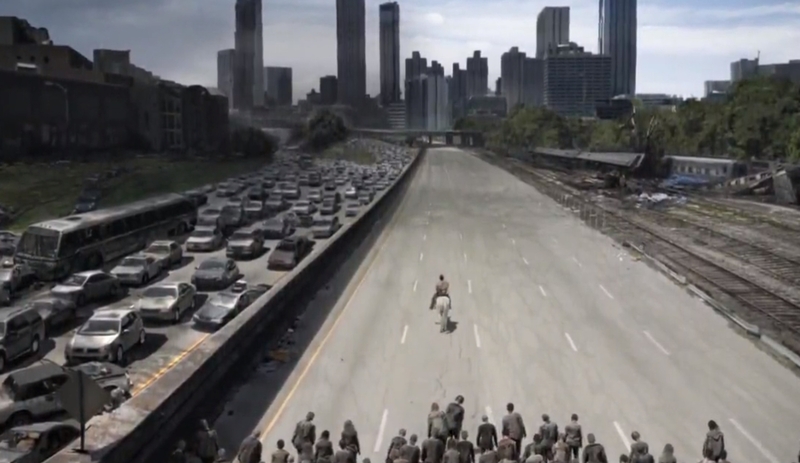 Heading into Atlanta in season one on horseback, we see an exact comparison even using the same graphics and effects. The only difference this time is that he is leading the herd into the city instead. “I’m looking for my family” he says as he slowly paces down the road again which is an exact comparison again from the first episode. for the first time watching it. 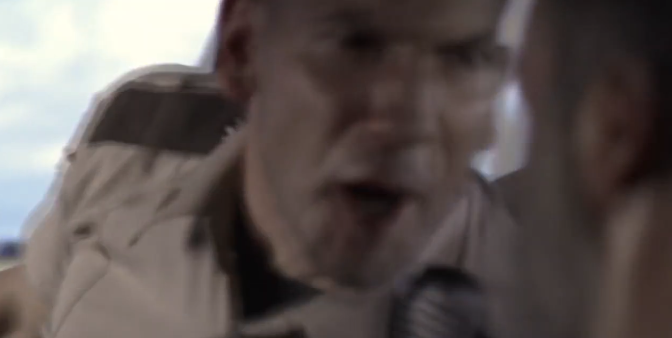 You just can’t help but love this scene, we finally get a conversation again between Rick and Shane as they sit in their patrol car staring at the wrecked car from the first episode. 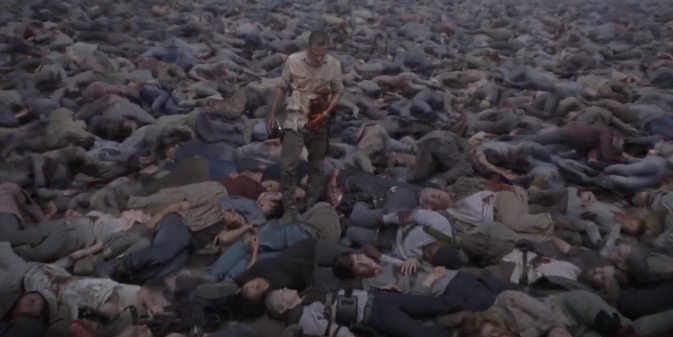 This was the scene that got Rick put in the hospital, as he falls into a deep coma from his wound. Notice how his current wound is in the exact place of where he was shot by the criminals. It’s just reference, after reference as we see Rick hallucinating his past. It’s like the show is telling us that he’s dying as people say that your life flashes before your eyes before you die. And that’s what we’re seeing. What’s even better is that we see Rick enjoying the food in the car, like he isn’t even in pain anymore. It’s like he’s reliving his past rather than seeing it. Shane openly jokes about Judith, asking how she is telling him that she’s got his eyes. Rick jokes back with him telling him she doesn’t have his nose though or ears. 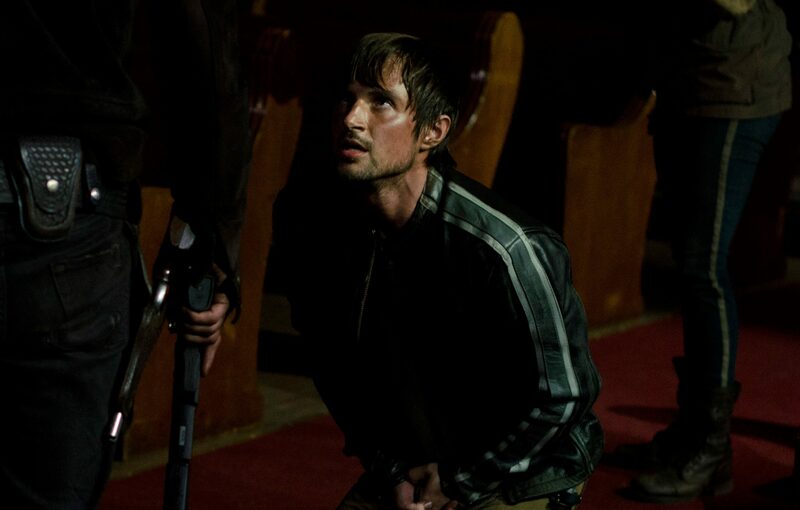 The scene suddenly escalates as we see Shane grab Rick, telling him to dig deep and find that rage again that he had burning inside him before to make it through this. Shane doesn’t want Rick to die here, this isn’t his time. Rick might as well ignore what Shanes saying to him as he clearly doesn’t get what he means and carries on about how sorry he is for killing him. 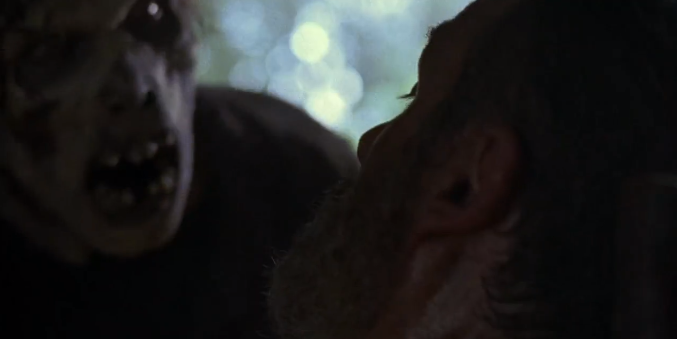 Sending Shane into his rage, we see him scream at Rick wakeup as we’re cut back to the real world. Shane wanted him to wake up so he could take out the walker that’s about to take a chunk out of him. If that’d happened then that would be it, complete game over. Making a temporary blockade we see the herd heading into the cabin, but Rick again escapes through a hole he punches through. The herd is closely behind more than ever before, but again we see him get onto his horse that’s waiting for him. Further on in the episode, we still see Rick hanging onto the horse and lead the herd as he mumbles to his self again that he needs to find his family. Hallucinating once more, we see him back at the barn. A voice is being repeated now, “what’s your wound”? This sounds a lot like Beth. One more time we see Hershel and Rick speak with each other, and it’s absolutely beautiful. 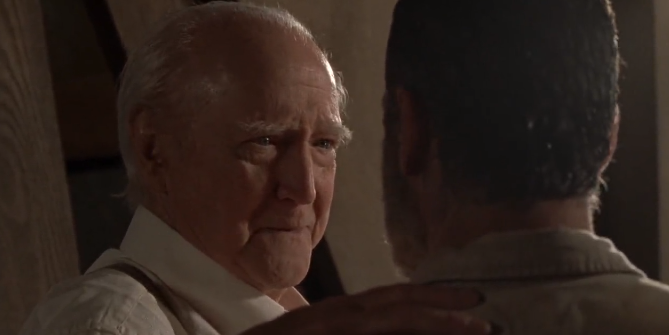 It’s even more touching to see because of the late passing of the actor that plays Hershel (Scott Wilson). 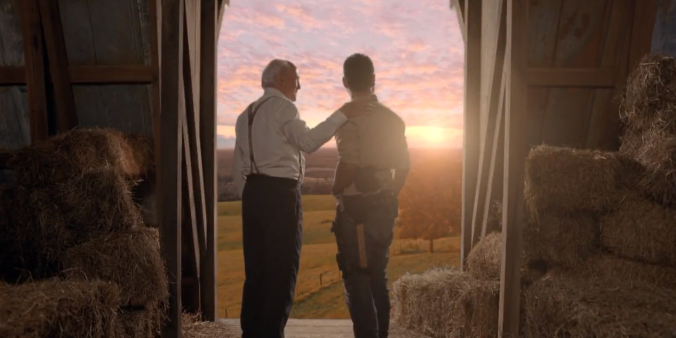 As soon as he was shown tears started rolling down my face as I know that Scott has passed as well as remembering Hershel’s final scene in season 4. Scott in an interview talked about how incredible it was to work with Andy one last time, as he tells us that it was one of the most incredible experiences he has ever had. Knowing that he got this scene finished before his passing though really made me smile, it was so perfect. Starting with the arm on Ricks’ shoulder, and a big smile on his face. 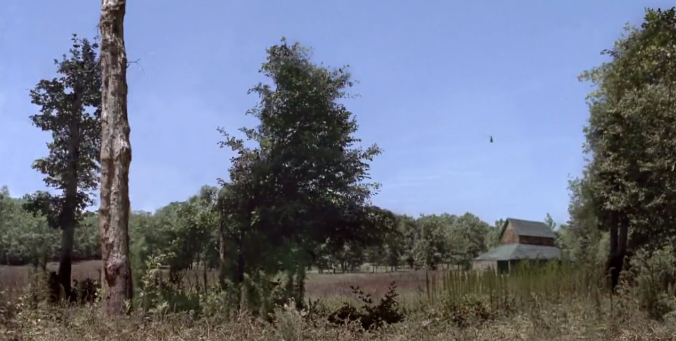 Hershel tells Rick to look into the distance, it shows Hershel’s farm from the barn that was burnt down back in season 2. Apologising to Hershel, Rick feels tremendous guilt for his, Beths, Glenn and everything that Maggie has lost. Talking about his grandson, baby Hershel he tells Rick that Maggie is a very strong girl. Which she is, we’ve seen through the series her character develop into a leader. Just like Rick. Again we see Rick speak about how he needs to find his family and keep them together, Hershel responds to him with “No you don’t, you only think you do”. Admitting to Hershel that he is tired, Rick begins to shed a tear as he tells him maybe he can find his family here. This is telling us that a part of Rick wants to give up, but he still has that fire inside him that Shane talked about that’s making him want to carry on. It’s like he’s on the fence, he could fall off of it either way. He can either fight to live on, or he can give up to finally be at peace with his family. Hershel doesn’t want him to give up, so like Shane, he tells him that he has to wake up by pressing on his heart that he feels as he comes back from the hallucination. I just want to say before I move on, thank you Scott Wilson. For that tremendous scene that reduced me to tears, you’ve been the voice of reason in The Walking Dead even after your character’s death. All of the characters are carrying a piece of you inside of them. And thank you for coming to do this one final scene with Rick that will forever be a piece of history. Rest in Peace. Back from the hallucination, we see Rick the same as before leading the herd trying not to bleed out. He’s fighting, he wants to make it. For Carl, for Michonne and for Judith. However, he passes out once more but this time. We see him back at the hospital, which everyone was expecting to see. Walking down the corridor just like in the first episode one after he wakes up from the coma. He comes to the door that he was terrified of previously, which said on it “Don’t open, dead inside.” However this time, we see it say “Open, dead outside”. This is telling us that within this hallucination, the hospital want’s him to go outside. It wants him to fight, and to move on. To find his family. Again we hear “What’s your wound?” being said and this time I believe it’s Abraham. It’s like a number of characters are repeating what Morgan said after he first found him. Walking down the corridor, we see Rick now coming to terms with what Shane and Hershel have been saying to him, as he opens the door and is shown a blinding light. The light at the end of the tunnel maybe? But surely that would mean he was walking to the end of his life? Or maybe it could be the hallucination trying to scare him away from going through there. Rick wants to live. We are being shown Rick find his fire. Find that fire he’s so famous for. Once he steps through the light, he arrives at a very powerful scene that is straight out of the comics. We see a lot of characters dead in this scene. Negan, Jerry, Carol, Daryl, Jesus and a lot more. This scene was brought to life from the comics, and it looks incredible. Did you get chills down your spine when Sasha rises? I did. She’s dressed in her combat gear, almost as if it’s directly from when she was at her strongest. This was something I was looking forward to, Sasha explains to him that even though everyone around him is dead. He did his part, he hasn’t ever been able to save them all and Sasha repeats to him that it’s ok. To stop blaming his self. Just like she did hers and the others did before them. Remember, Rick never asked for any of this. He never wanted to be a leader, people wanted to follow him. To see him as a leader, they knew Rick would get them there eventually. In the shot above, we see all of the characters that are deceased within the show as well as the ones still alive. There are people like Daryl, Negan, Tyreese, Beth etc. Let me know if you see anyone that will be surprising! By giving them the strength that they needed to do what they had to do. “Toward the good, toward the brave, toward love”. She also goes on to tell Rick that he isn’t going to find his family, as they aren’t lost. Finally, Rick is coming back to his senses. And it’s the one he’s lost along the way that is getting him through this, giving him the strength to fight and find that fire inside of him now that he’s so close to. Waking up again, Rick falls off the horse. The horse flees into the distance as he arrives at the camp of the project. Everyone around him is dead, this isn’t another hallucination. This is happening now. Ricks wound opens again as his bandage comes loose. Making a final stand, Rick finds the fire within him to pick up his famous .357 Colt Python and take out the walkers coming at him. Something is coming now, making noise within the trees, it’s the herd. The herd has arrived to take Rick, he’s still being chased by them. They all want him, but again he finds his footing and flees the scene. If Rick doesn’t find help soon, this is it. You can now see how much blood he’s lost, he’s walking with the herd like belongs with them. But as he’s giving up what do we see? The bridge. The bridge that Carl built. The bridge that everyone built for the future. Rick knows what he has to do, he has to sacrifice Carl’s future to survive. But as we see this, he hears Daryl’s voice that everybody has been hoping for. He takes his time, but he finally hears with the rest of the communities as they charge in front of him to fight with the herd. 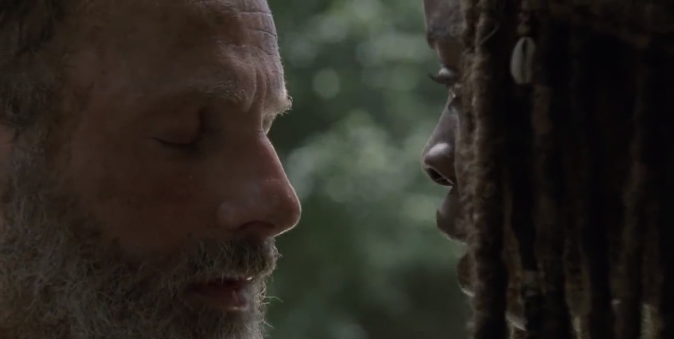 Michonne stays with Rick and promises that she’s going to get him out of here and save him. 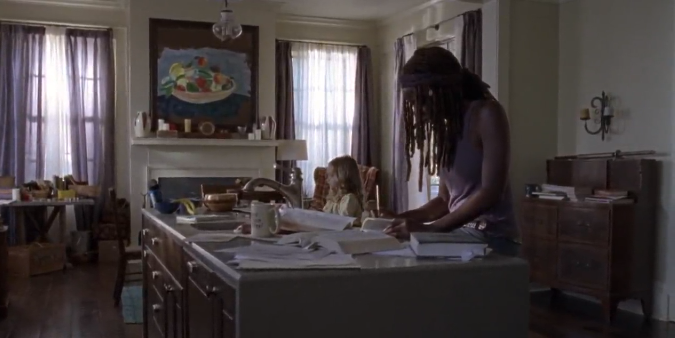 Michonne speaks with him, in a way that the hallucinations have been speaking with him. She tells him that she fell in love with him because he’s a fighter, and he never gives up. So she wants him to fight, to fight for Michonne and to fight for everyone else. Replying to Michonne that they’re his family. They’re all his family, not just Lori or Carl but everyone he’s helped and been helped with along the way. Rick realises that this is another hallucination, as he wakes up alone. But they all gave him the final strength that he needed to make the final push across the bridge. Taking his last steps, we see Rick finally finding that fire. Finally showing us that he is going to fight, and to survive for all of us. We see now what was coming before, the water level is rising to a point now where the bridge will give way easily. He knows what he has to do, this is his final test to light the fire. As a walker is about to kill him, we finally see the communities arrive at the scene. This isn’t a hallucination anymore, this is what is happening. He has to destroy the bridge, to save everyone as it heads towards Hilltop. 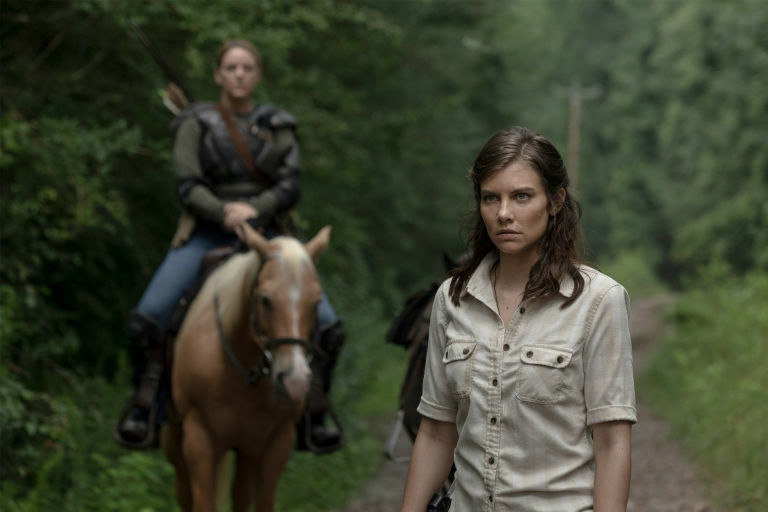 Maggie leads them, as the plan is to fight them all off and to save Rick. But there are way too many walkers for them to get through. Daryl tries his hardest from afar using his precise accuracy to buy Rick time. To save his family, Rick has to destroy the bridge. One last time we see Rick pull his Colt Python from his holster as he spots dynamite be knocked onto the bridge. As he shoots the dynamite he says to himself, “I’ve found em” meaning his family. The whole bridge goes up in flames as Rick sacrifices himself, to give all of his family the strength to carry on without him. This scene is perfect, this is the scene that will rebuild The Walking Dead. It’s been struggling with ratings for a few seasons, they knew they had to pull something big to keep people interested. People that were getting tired of it, people who weren’t following the story anymore. If you watch this episode and find yourself still not impressed by the capability of the writers and actors then there is something wrong. This episode is 10/10. We’re now shown a very chilling scene, as violins start to play and the group cry out for Rick. Daryl is in tears, as he watches the herd fall into the river. We see Carol and Maggie pulling back Michonne from going to find him, Daryl has lost his real brother as he walks away from the scene in despair. By this point now, I’m in complete tears as I can guarantee every single one of you’re watching it. This has to be the most heartbreaking scene I’ve ever had to watch from any TV show or film. I just wish Daryl would’ve had more of an impact in the final scene, maybe showing his destructive path that we all know to fight his way through the herd to get to Rick before he goes up in flames. But we’re left with Daryl sobbing his eyes out, and if Daryl cries. We cry. An A, or a B? Towards the end of the episode, we see Jadis once more as she looks upon the smoke in the distance. The smoke is fresh and dark, showing no signs of white as of yet. We learnt this from Mika back in Season 4, on the episode that they both died in. As this episode is full of references, I have no doubt that this was purposefully put together like this as well. As the radio’s frequency starts to go wild, she looks to the sky and hears the helicopter. The helicopter begins to land at the extraction point. Looking towards the river we see Rick. She tells him that she’s found a B. Not an A that she promised, she wants to save him as she saved him before. They accept her offer as Rick is extracted from the zone with Jadis. Giving us a POV of Rick, Jadis speaks to him telling us that Rick is still very much alive. And is being taken away to be treated, to a new world. That new world is no doubt the Commonwealth. I’ve seen a few theories about what A and B could be, the most common one being about Alpha and Beta from The Whisperers. But I think they’re simply hinting that the Whisperers are coming and that A and B has a much deeper meaning. Could it mean that they’re sectioned into two groups, the Strong and the Weak? Kind of like how we see the film Land of the Dead, as the weak are left out on the outskirts to fend for themselves against walkers whereas the wealthy people are on the inside, high up in buildings safe from any kind of danger. Notice the music playing, this music again ties into the referencing of previous episodes. This music is from the very first episode from season one as the camera pans out from a top-down view of Rick trapped in the tank as the undead are feasting on the horse he found. Who else do we hear for the first time in this episode? Glenn. This is Glenn’s first contact with Rick, referencing even more that Glenn has finally got him to where he is going. Daryl tells us that in episode 4. That Glenn has gotten him to where he has now, no one else. Glenn. I cannot think of anything more perfect from this episode, I just can’t believe they’re keeping him alive. Open to his return, imagine the hype that will occur for when he finally does. It will be legendary. Thank you so much Andy, for the 9 years of entertainment you’ve given us. You’re an incredible actor and have shown us that anyone can be a hero. No superpowers are needed, simply the strength to fight for what you want. I am very much looking forward to what’s to come with Andy. As he has a trilogy of movies coming out, set to the first release as soon as 2019 to carry on his story. I’m going to rate the episode from the beginning of it to just before the time gap. As I don’t think the impact of that should be involved. I cannot fault this episode one bit, the writing, acting was perfect. Everyone came together, the actors, the crew, the fans, the characters as one big family. And Rick showed us that, Rick showed everyone the way after he fought for the safety of others one last time. Now that we know Ricks fate, what do we think they have installed for him? Admitting on Talking Dead shortly after Rick Grimes will have a trilogy of movies that he will star on. Presumably from where he arrives after he is whisked along with Anne in the helicopter. I’m still coming to grips with it, I wrote most of this review as I watched it for the first time but i’ve now watched it three times and still, I’m finding new references and lines that I missed. Stick with The Walking Dead, I can guarantee this new world is going to be incredible. Now, we’re shown a clear time jump. As the scene stays the same from where Rick was taken but now is completely overgrown. I mean, years overgrown as we’re shown walkers still roaming the world. We’re shown a new face of warriors as this scene begins which if anybody who reads the comic books will know that its Magna’s group. A group that has to gain trust from Alexandria to be allowed inside its walls. This is a fantastic way to start the new world of the show. Magna in the comics is a tremendously strong character. She is also very smart, a born leader however just like Rick originally she didn’t choose to be one. She was against it until people wanted to follow her in the apocalypse. We also see a few more of Magna’s group with her, including Yumiko, Connie, Kelly and Luke. As the group are clearly running from a herd, we see them being surrounded in the middle of a field as the other survivors question Magna about what they should do. Magna is trying to think of a plan as the herd closes in, we see an opening for them made by a mysterious shooter. A little girls voice shouts at them to follow her, we all know who this is, it’s Judith. There is a time gap. A very long time gap, 6 years in fact. Judith is a 9-year-old girl living in the apocalypse. She carries her very own Katana that I can only presume Earl the blacksmith at Hilltop made for her. 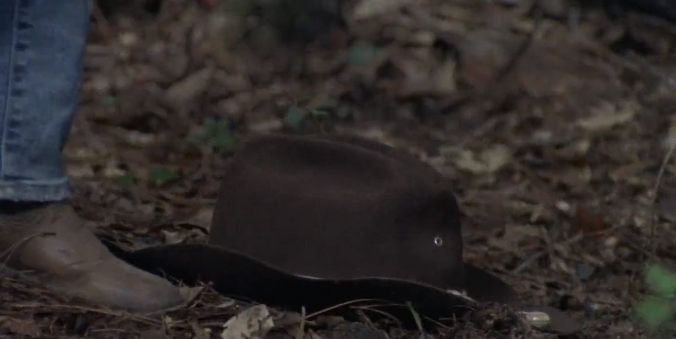 As well as Carls hat that Rick originally gave to him back in season 2. Judith is carrying on that legacy and is surrounded by the best people possible.